Dining on Brilliance of the Seas is diverse, interesting, tasty, convenient and adaptable for passengers with special dietary needs. Minstrel Dining Room (decks 4 and 5, aft): The ship's main dining room spans two decks and has a gushing waterfall as its focal point. The restaurant is open for breakfast, lunch and dinner, and operates on an open-seating plan for breakfast and lunch. For dinner, passengers can choose the line's signature My Time Dining and pick a specific reservation time in advance (between 6 and 9:30 p.m.), but can then change reservation times daily or even walk in without a reservation. The My Time Dining option requires pre-payment of gratuities. Otherwise, passengers can choose traditional dining, which means choosing either an assigned 6 or 8:30 p.m. dining slot. If opting for the set times, arrive early to avoid lines. Regardless of the reservation option, be sure to select as far ahead of the sailing as possible, as popular times (such as the 6 p.m. seating) fill quickly. Minstrel's food is flavorsome and the menu changes daily. Those on special diets can generally find suitable entrees. The vegetarian artichoke-filled crepes au gratin, for example, are a must-have, regardless of one's dietary preferences. Special dietary needs aside, there are several renowned courses at Minstrel. At breakfast, passengers can enjoy the cooked-to-order omelets and Belgian waffles. Diners generally opt for light and quick fare for lunch, such as the tomato bisque and panini sandwiches. At dinner, popular appetizers are the chilled shrimp cocktail and crab-stuffed mushroom caps. Among the well-liked main entrees are the roasted lamb shanks au jus as well as the San Francisco cioppino. Desserts of note are the Key lime pie and the berry cobbler. On select sailings, the restaurant offers a midnight buffet once per cruise. The night is announced in the ship newsletter, Compass. Restaurant employees can also answer questions about the schedule. Extravagant ice carvings are presented alongside a diverse seafood display, and the desserts are impeccable. The Black Forest cake, in particular, is not to be missed. Windjammer (Deck 11, aft): The ship's top-deck buffet is a good place to grab a quick breakfast or lunch before a shore excursion. As with the buffets on its Radiance-class sisters, there are several themed stations at lunch and dinner (pasta, light-eating selections, salads, etc. ), thus eliminating a single long line of hungry passengers, as diners are dispersed to the separate stations. In the evenings, the casual setting is somewhat transformed to a restaurant atmosphere, with a more quiet ambience. Windjammer is open for breakfast from 6 to 11 a.m., lunch from 11:45 a.m. to 3 p.m., and dinner from 6:30 to 9 p.m. Among the breakfast selections are cheesy scrambled eggs, simple yogurt parfaits and pancakes. Among lunch and dinner options are Chinese stir-fries, fried chicken and vegetarian enchiladas. The food is delicious for buffet fare, and selections change throughout the week, with the curries especially a hit with passengers. Lemonade, ice tea, coffee and water are offered at no extra charge; wine, beer and sodas are also offered for sale. Park Cafe (Deck 11, midship): Those who find even a buffet restaurant too formal will appreciate the tasty fare at Park Cafe, as well as its casual pool-area location. The deli-style eatery offers made-to-order salads and sandwiches, paninis and a variety of gourmet pastries and coffee. Breakfast-Only Room Service: The only fee-free room service available onboard Brilliance is the continental breakfast option, which includes morning beverages such as juices, coffee and tea for beverages, and bakery selections such as bagels and doughnuts, yogurt, fruit and cold cereals. This free option is available is only available from 6:30 to 7:30 a.m.
Cafe Latte-tudes (Deck 6, midship); a la carte pricing: This coffee space is a perfect spot to relax with a mocha while reading and planning the day's events. The quiet spot is also a good space for a post-excursion respite. 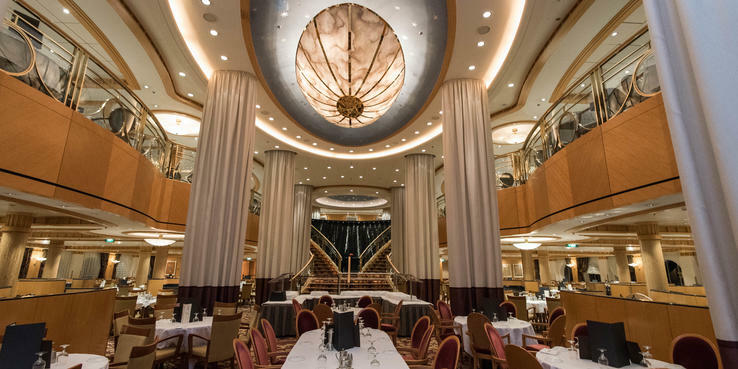 Chops Grille (Deck 6, midship); $35: An elegant steak restaurant serving choice cuts and enormous baked potatoes, Chops Grille is popular for romantic parties of two, or groups celebrating special occasions. For passengers who forgo beef, seafood and vegetarian options are available with advance notice. Seating is by reservation only. Giovanni's Table (Deck 6, midship); a la carte pricing: Passengers of all ages enjoy the casual Tuscan atmosphere of Giovanni's. The trattoria tweaks traditional favorites with contemporary accents. Seating is available indoors and al fresco, and the food is served family-style. The focaccia bread and pasta dishes are safe bets, but the braised meats and stews are especially flavorful and memorable. Chef's Table (Deck 6, aft); $85: Passengers with three and a half hours to spare will enjoy this dining experience spotlighting a five-course set menu of gourmet dishes prepared and personally presented by a senior chef. Every course is accompanied by wine pairings, described by a sommelier. At the end of the meal, diners are presented with an autographed cookbook. Reserve before your sailing, as seating is limited to 16 nightly; Chef's Table may be altogether unavailable on certain nights of some theme and short-itinerary cruises. Rita's Cantina (Deck 11, aft); a la carte pricing: Located near Windjammer, Rita's serves hearty Mexican fare along with a wide selection of creative margaritas. The jalapeno poppers and hearty tortilla soups are popular appetizers, and the grilled quesadillas are a favorite main course. The restaurant is suitable for families with children in the daytime; evenings, which carries a $3 cover charge, are adults-only with dancing and live guitar music. Izumi (Deck 12, aft); a la carte pricing: This bistro offers Asian dishes of both traditional and fusion themes. The flawless, delicate presentation of the entrees alone is worth a visit to Izumi. Ingredients used are fresh and flavorful, as is especially evidenced in the sushi rolls and sashimi. Popular hot Japanese items include the Hot Rock meat plates (ishiyaki) and sukiyaki. Room Service: Delivery is available 24 hours a day, at a cost of $7.95 per order (including gratuity). Non-continental breakfast items include egg dishes and pastries. At lunch and dinner, menu items include burgers, chicken wings, grilled salmon and Philly cheesesteaks, among other items. Orders to Grand Suites and higher will not carry a charge.